Can this good-looking bulb really make your life a little more convenient? A great Design and Build Quality with added Convenience in the bedroom. A Size & Weight that limits the usability of the bulb in certain fixtures, such as short-shaded lamps. Using this bulb in a lamp on a nightstand combines Functionality with a great Design to create a Convenience that standard chargers just can't match. At first thought, the cost of the PowerBulb might seem too high. But, when you think about what it is and what it does, the cost is actually lower than the components alone, with added Convenience. On Amazon, the average cost of a USB wall charger is $10, and the average cost of a compatible LED bulb averages $10-$15. That puts the cost of the components at around $35, which is right about the price of the PowerBulb. The difference with this product is the bonus of not needing to run additional wires or have cords on the floor, behind a nightstand or a desk. For many, that benefit alone will justify the cost. The PowerBulb is definitely a beautiful product. Everything from the curve of the globe to the color of the base is clearly shows that a lot of thought was put into this bulb. Even the soft touch material used on the base of the bulb makes it easy to grip when plugging in or removing a cable, as well as when putting the bulb into or out of a socket. There are still a couple of things that would absolutely make the PowerBulb a better product. For example, the placement of the USB plugs makes using it in a lamp with a closed back and an open face, such as a desk lamp, difficult or impossible. If those plugs were accessible from both directions, perhaps on a hinge, it would expand the types of lamps that are usable. The convenience will definitely vary based on where you want to use the PowerBulb. Its ideal scenario is as a bedside accessory. The warm light is perfect for a nightstand lamp, and the lack of cords running under the nightstand or under the bed means less cords lying on the floor. For a couple, one of these on each side of the bed allows for great reading light and the ability to charge a phone and possibly a tablet each, without having to run extra cords all over the bedroom. Overall, the quality of the PowerBulb is top notch. The acrylic on the globe is clean, clear and free of imperfections. The soft touch rubber used on the base is a nice touch, which makes it easier to work with. The USB ports, a piece that is frequently loose on products, is seated and mounted firmly in place. Even the printing of the logo on the rubber is unscratched, even after traveling and testing. There are a few imperfections in the quality, however. The intersection between the white ring and the acrylic globe, as well as its intersection with the rubber body have give. With just a little pressure, the joints will creak and the globe will spin just a little. In general, this is an issue that will infrequently be noticed, except when screwing the bulb into its new home. The PowerBulb might just work better than advertised. At 600mAh, the charger should be incredibly slow, and should create notifications on certain devices, such as the Lumia 635. We often test with that phone because it is one of the most sensitive phones to low power sources on the market. Even the Lumia did not complain about a slow charge, which was pleasantly unexpected. The bulb itself also works well. It is both bright and warm, making it a perfect bulb for the bedroom. Fit into a bedside lamp, it provides a good light for reading or getting dressed, and does not create a light that will wake you up, like a cool bulb would (blue light tricks your brain into wanting to be awake). The bulb itself is physically large. In fact, it is large enough that there will be fixtures that the bulb will not fit inside. While the majority of places where the bulb height would become a problem are in places where the bulb would be of no benefit, such as a ceiling globe, there are some shorter lamps where the bulb will not fit. 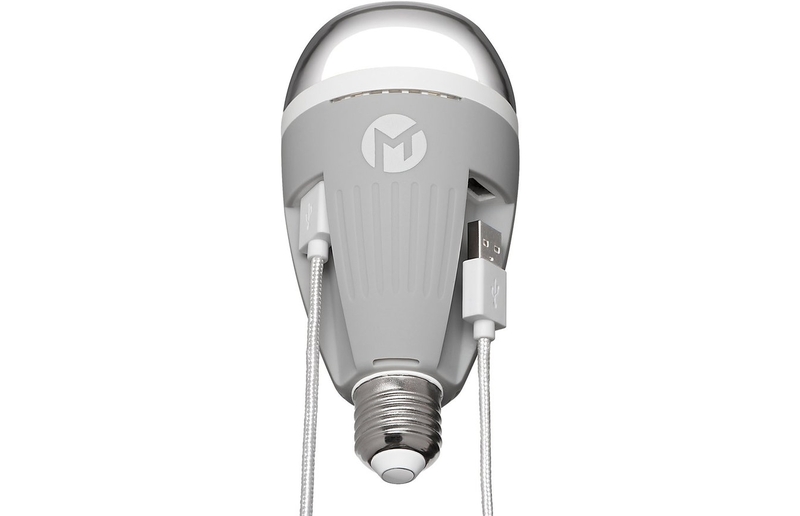 The weight is also far more than a normal LED bulb, including many smart bulbs. The weight is going to cause some problems for smaller lamps, such as standard desk lamps with a flexible neck, where the bulb could drag down the socket or tip over the fixture completely. The lightbulb uses a standard E26/E27 base, so you can theoretically use it in any light socket you have. The Design of the bulb makes it very tall, meaning its Size & Weight will limit its compatibility somewhat. The charger consists simply of 2 USB plugs - that makes it a nearly universal charger. Unfortunately the USB bus claims to support only 600mAh of power, much less than some devices need to charge. When used with our devices, however, we did not receive slow charging notifications, suggesting that the stated amperage is not correct - definitely for the best.